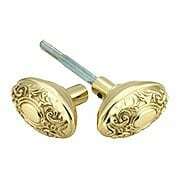 Add a touch of elegance to your home with our decorative and fancy door knobs. 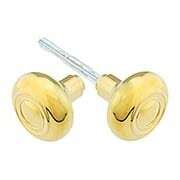 These solid brass knobs come in a variety of striking designs. Add a matching door backplate or rosette to complete your unique door set. 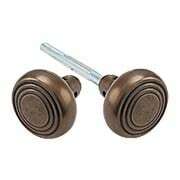 P. & F. Corbin pictured this handsome neo-classical knob design in their 1905 door hardware catalog. 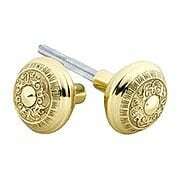 Our faithful reproductions are forged from solid brass, giving you a lifetime of beauty and performance. 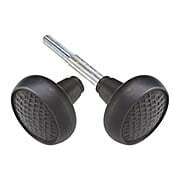 Includes a 20 TPI threaded steel spindle. 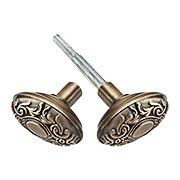 These elegant Meadows knobs were inspired by P. & F. Corbin's "Como" pattern of 1905. 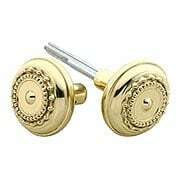 Finely crafted of solid, forged brass, the beaded design adds a neo-classical touch to any room. Includes a 20 TPI threaded steel spindle. 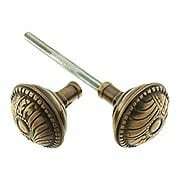 P. & F. Corbin pictured this handsome neo-classical knob design in their 1905 door hardware catalog. 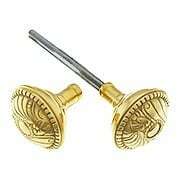 Our faithful reproductions are forged from solid brass, giving you a lifetime of beauty and performance. Each knob comes in our exclusive Antique-By-Hand, a living finish that ages gracefully over time into a beautiful natural patina. Complete the look with the matching back plate (R-01NW-712720-ABH). A threaded steel spindle is included. 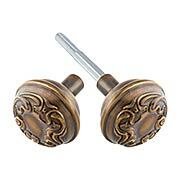 Our Mission-style knobs make an ideal addition to any room in your Craftsman-style home or bungalow. 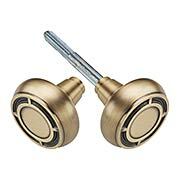 Harkening back to the Spanish-Colonial period of the Western frontier, each knob features inlaid steps nestled within its geometric shape. Available in four popular finishes, these heavy-duty reproductions are forged in solid brass for enduring quality, backed by our five year warranty. These lovely oval door knobs were designed by Yale & Town, circa 1910. 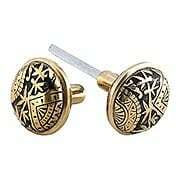 The decorative Renaissance pattern, known as "Largo", is reproduced in top-quality forged brass. 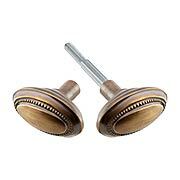 Each knob comes in our exclusive Antique-By-Hand, a living finish that ages gracefully over time into a beautiful natural patina. Complete the look with the matching back plate (R-01NW-712744-ABH). A threaded steel spindle is included. 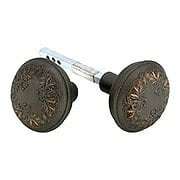 Purists will delight in this faithful reproduction of P & F Corbin’s lively and charming “Roanoke” pattern doorknob. The circa 1900 design works well with everything from Queen Anne to Craftsman, from restorations to new construction. 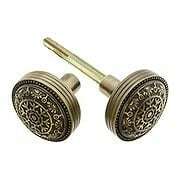 These knobs are cast in solid brass and left unlacquered, allowing them to age gracefully over time, just like the antique originals. Purists will delight in this faithful reproduction of P & F Corbin’s lively and charming “Roanoke” pattern doorknob. The circa 1900 design works well with everything from Queen Anne to Craftsman, from restorations to new construction. 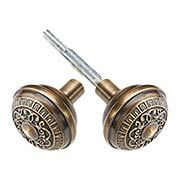 Cast in solid brass, these knobs come in our own Antique-By-Hand finish. This hand-applied process produces a living finish that continues to age gracefully for many years to come. 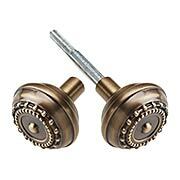 Featuring rugged, hand-hammered details, our Pasadena knobs are classic Arts & Crafts design. Available in your choice of four popular finishes, these vintage reproductions are the perfect enhancement to any Craftsman-style home or bungalow. 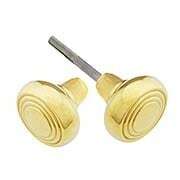 Substantial forged-brass parts provide enduring quality, backed by our five year warranty. Reproduced from a circa 1910 original introduced by Sargent and Company, our Art Nouveau Door Knobs in Antique-By-Hand bring an elegant touch to your decor. The Alby design recalls organic motifs of the period showcasing a graceful, floral pattern. Beautifully forged in solid brass, they come in our exclusive, living finish that ages gracefully over time into a beautiful natural patina. Although the design of our Beaded Oval Door Knobs in Antique-By-Hand date from around 1900, they are a lovely choice for traditional and modern interiors alike. Beautifully forged in solid brass, they come in our exclusive, living finish that ages gracefully over time into a beautiful natural patina.